Bipolar disorder is a brain disorder that causes unusual shifts in mood, energy, activity levels, and the ability to carry out day-to-day tasks. People with bipolar disorder can have extreme mood swings. They can have long periods of depression, periods where they experience mania, and then other times where they have normal moods. It should be noted that the time in between the depressive and manic stages of bipolar vary from person to person. These moods swings are much more severe than normal up and down days that everyone goes through as part of life. Defined by manic or mixed episodes that last seven days, or by symptoms that are so severe that the person needs immediate hospital care. Usually, depressive episodes occur as well, typically lasting at least two weeks. Defined by a pattern of depressive episodes and hypomanic episodes, but no full blown manic or mixed episodes. 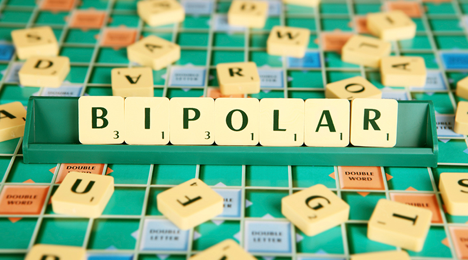 Diagnosed when symptoms of the illness exist but do not meet the diagnostic criteria for either bipolar I or II. However, the symptoms are clearly out of the person’s normal range of behavior. Can be thought of as a mild form of bipolar disorder. People living with cyclothymia spend at least half their lives in either a very good or very bad mood. Although these moods cause distress and impairment in functioning, they don’t reach the severity of Bipolar I, Bipolar II, or major depression. Elevated, expansive, or extremely irritable mood. This mood is persistent throughout the course of several days. (Not simply a few hours). Excessive involvement in potentially destructive behaviors (such as spending sprees, sexual indiscretions). Increased planning and goal setting, usually unrealistic goals and plans. Genetic – a family history of bipolar disorder is one of the strongest and most consistent risk factors for bipolar disorder. People with first degree relatives people with BPAD I have about ten times the risk of developing Bipolar themselves. Environmental – Bipolar disorder is associated with divorced, separated or widowed individuals. Bipolar is more prevalent in countries with higher incomes as opposed to lower income countries. Mood stabilizer such as: Lithium, Lamictal (for bipolar depression),Tegretol, Zyprexa, and Depakote. Antipsychotics such as: Risperidone, Olanzapine, Quetiapine, Ziprasidone and Asenapine. Antidepressants, generally used simultaneously with mood stabilizers, such as: Trazodone, Zoloft, Paxil, and Wellbutrin. Patient learns to change harmful or negative thoughts or behaviors. Patient is educated on living with bipolar disorder and how it is treated. This education hopes to teach the patient how to recognize when they are headed toward an episode so that they can get help before things escalate. Patient and family members learn how to cope with and recognize signs an impending episode so that they can help work through together. Patient learns to manage their relationships and day to day living in an attempt to “normalize” their daily routine. This accompanied by a strong sleep schedule can help protect against manic episodes. Officers are reminded to always think of safety when to helping a person living with bipolar disorder. Officers should take in all of the risk factors of a situation and try to deescalate the situation using any of the above information to build rapport. Officers are reminded that people living with bipolar disorder often have to live with the stigma that has been placed on people living with mental illness. It is important that officers not perpetuate that cycle of stigmatization by utilizing the information that they have gained in this section to help link them resources. Officers are reminded to use the many resources at their disposal to assist any of the people they come in contact with living with bipolar disorder. It is hoped that by linking them to resources their quality of life will improve while lessening their interaction with law enforcement. Black, D. W., & Grant, J. E. (2014). DSM-5 TM guidebook the essential companion to the Diagnostic and statistical manual of mental disorders, fifth edition. Washington, DC: American Psychiatric Publishing. Yatham, L.N., Kennedy, S.H., O’Donovan, C. et al. (2005) Canadian Network for Mood and Anxiety Treatments (CANMAT) guidelines for the management of patients with bipolar disorder: consensus and controversies. Bipolar Disorders. Diagnostic and Statistical Manual of Mental Disorders, 5th edition, American Psychiatric Association, 2013.